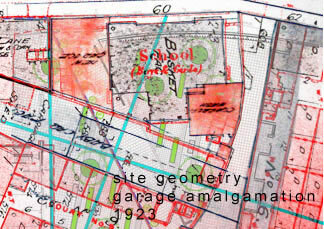 A proposal for an integrated surface pattern, lighting, planters and seating, drawn from the amalgamation of site geometry at the construction of Smithfield Garage in 1923. The site, bordered by Digbeth, Meriden, Coventry and Oxford street, contained many different trades typical of the Digbeth area – including a pram manufacturers and basket manufacturers which centrally occupied the public square site. The pram manufacturers would have utilized the surrounding trades, therefore the surface pattern used three lines that remained constant over the previous development of the site, to create a basket weave that interlocked the coming together of materials from its periphery. This culminated in a central offset space. 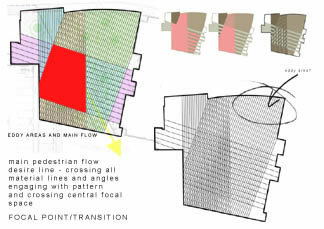 As a central walkway previously dominated the square's proposed design, this offset central pattern allowed for the square to be less transitional, formal and didactic whilst also activating previously dead spaces outside of this main walkway. However, walking the quickest desire line through the space (as a shortcut form Meriden to Coventry Street) would also allow for the experience of all aspects of the pattern. 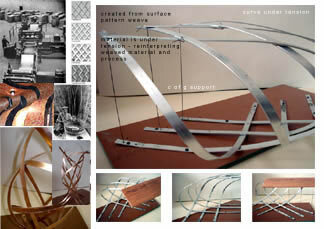 Curving steel upward from the grid allowed for the formation of planters and seating structures that utilised the basket weaving principle of material under elastic tension. 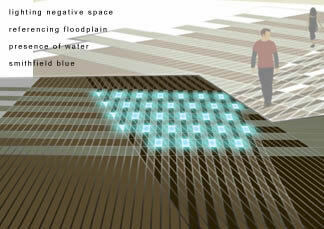 Lighting enhanced the central space, whilst echoing the nature of the site as a floodplain and the distinct blue of the 'Smithfield' sign. Planting was also suggested to reinforce the identity of the Digbeth area and its past pockets of recreational and rural ground.